Reading this post seeing Marcads name,just want to share a picture. DC,how about a +40 2-stroke Cup race? CD,how about a +40 2-stroke Cup race? Sorry,but I found that funny. I too ride with my Marcad57 sticker on my helmets. 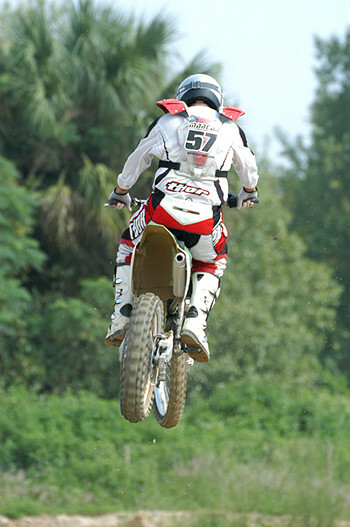 I always loved watching him ride.I got his jersey from `92 Orlando SX when he rode for TUF right be fore he quit racing. Tampa can draw more the Jacksonville,buy no we have not had one since 1999. From what Im told,it is a new site that the track is going,just down I-4 from the old one. Schedule: Gatorback Jan 2-3 Reddick Jan 9-10 Dade City Jan 16-17 Lake City Jan 23-24 Lakeland Jan 30-31 (New track off 1-4 exit 48)??????????? Gatorback Feb 6-7 Lakeland new track,any news on this? Opps, "Sounds" of the passed. Says on Game Stops add that if you pre-order it from Game Stop you get 5 free tracks or something,any info on that?